After leaving Ann Arbor, we had a few days before we needed to be in Rochester…so we headed through Detroit and into Canada. As you may expect, getting a huge RV across the border was a little time consuming. After we made it through the HUGE line…they wanted to search the RV and asked us a million questions. They didn’t seem to understand why Matt’s “occupation” was “driver of the RV”. Or why we didn’t really have an “end” destination. But, we told them what they wanted to hear and they let us into their beloved country. We were in Canada baby! Wooooo! On the recommendation of Jeff and Kristin, we stayed at The Pinery Provincial Park near Grand Bend, Ontario. This was a HUGE park…6,330 acres. With over 1,000 campsites, a restaurant (yes, we got grease! ), a rare Oak Savanna ecosystem, freshwater coastal dunes, nature centers, trails, huge beaches, and more…you could never run out of things to do. They are even open in the winter and have yurt camping as well. We pulled in and got settled. The campsites were semi-private…but definitely not private enough to keep gawkers from making comments on our glowing blue spaceship. We decided a trip to the beach was in order. After driving along dark, tree-lined roads for what seemed like forever…we came to a bright open clearing and TA DA!!! There it was. Lake Huron. Huge. Breath-taking. Wow. 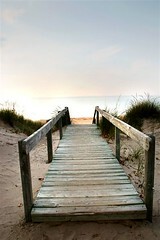 We walked down some lovely wooden steps, crossed the super soft sand and headed for the water. Bella and Matt entertained each other making sand castles and I started on a new book. We met a lovely homeschooling family from near Toronto…Bella played with their kids while the adults talked about the unseasonably warm weather, the Canadian Thanksgiving (that weekend), and veggie oil. Back at the campsite later, we built a roaring campfire and made s’mores together. We called and talked with each of our families and shared about our day. It was truly relaxing…and we thoroughly enjoyed our time there. It was a bit more costly than “camping” in a parking lot like we normally do in between stops, but definitely worth it. Thank you Canada!